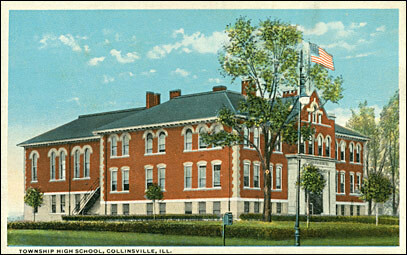 The first gymnasium was added to the back of the township high school in the 1200 block of Vandalia Street during the 1908-09 school year. The high cost of steel girders forced the choice of wooden beams to hold the second floor above the gymnasium. Three posts were used to give the necessary support. To help the situation, they decided to offset the posts instead of placing them down the middle of the floor. Opposing teams claimed that Collinsville played with three extra players with the way they used the posts to their advantage. The gym just fit into the allotted space, as the court extended to the the east, west, and south walls. These walls were considered out-of-bounds. The backboards were mounted flat on the east and west walls. The north wall had three rows of bleachers that could accommodate 120 people. This location was used for 6 years. The last game played in this venue was in February 1914. The Kahoks defeated Co. H of the Missouri National Guard, 47-15.